Noise levels are low enough in Mecaer’s MAGnificent cabin interior for the Bell 429 helicopter that passengers can carry on a conversation without headsets. The Bell 429 helicopter on display here at EBACE this week (Booth U029) features the new MAGnificent luxury interior developed by Mecaer Aviation Group. The completions package for the light twin is intended to offer a new level of comfort and functionality for passengers in the cabin. One of the main breakthroughs is Mecaer’s Silens technology for reducing interior cabin noise. This is based on a capsule installed between the airframe and cabin interior that is only attached via the floor and forward and aft bulkheads. By avoiding contact with the ceiling, less noise gets into the cabin from the 429’s engines. “It means that passengers can comfortably have conversations in the cabin and enjoy movies and music without having to use headsets,” Grayson Barrows, Mecaer’s director of marketing and sales, told AIN. The company has applied the Silens technology to several rotorcraft models and may seek to introduce it for fixed wing aircraft too. Also new from Mecaer is its I-Feel (Inflight Entertainment Enhanced Lounge), which allows passengers to get online and control entertainment and other cabin systems from their personal electronic devices. These include the electro-chromic windows that can be adjusted to avoid glare from sunlight and the environmental control systems. The dual-pane windows also reduce noise in the cabin and ensure passenger privacy. The cabin interiors were developed by Mecaer’s design studio in Rome. It will be optional equipment for the Bell 429, available through a supplementary type certificate. There are now around 50 Bell 429s based in Europe. 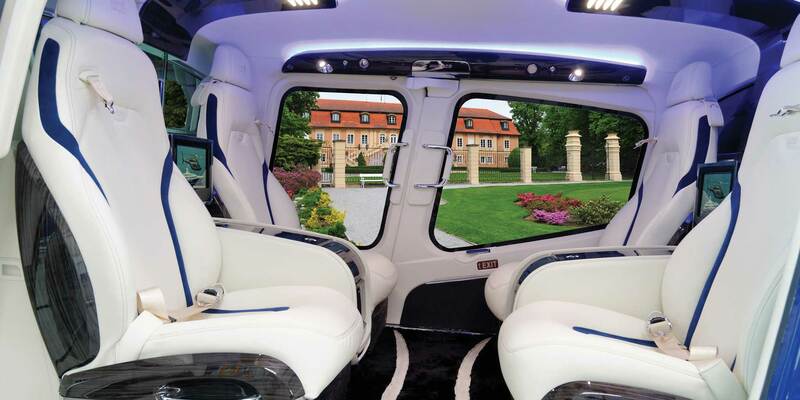 In addition to the VIP configuration, the helicopter can also be used for a variety of emergency medical and parapublic applications.